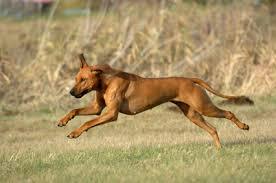 The Rhodesian Ridgeback is a large, powerful and athletic hound, originally from Rhodesia (now Zimbabwe) in Africa. These dogs were originally bred to protect the early white settlers in Africa, and to act as hunting dogs, particularly lions. They are also known as The African Lion Hound, for this reason. Of course, no dog could bring down a lion by itself; the african hunters would use a pack of 6 to 8 dogs, to chase and intimidate the lion, with the dogs eventually driving it into a corner where the hunters could then shoot it. The Ridgeback is agile and athletic enough to avoid the lion's claws and teeth, at the same time being large and powerful enough to make the lion take notice. This makes it sound like the Rhodesian Ridgeback is a fierce and aggressive breed, but nothing could be further from the truth. The other side of their breeding heritage was to protect the early African settlers from other animals and humans. They are very much family dogs, and NEED human company. Left on their own for long periods of time, they can become bored and destructive. Where does the breed name come from? We already know that they originated in Rhodesia (now Zimbabwe). The "ridgeback" refers to a line of fur on their back, growing in the "wrong" direction, shaped like the blade of a broadsword. It runs from just behind the shoulder blades down the dog's back to about 6 inches short of the tail. It's just a line of fur growing in the opposite direction to the rest of the coat. Occasionally, Ridgeback puppies are born without the ridge. They will be every inch a Rhodesian Ridgeback in every other respect, but some unscrupulous breeders will tell potential customers that the ridge will develop as the dog gets older. It will NOT! If you want to enter your dog to dog shows, then the ridge must be there from birth. It never grows in later. 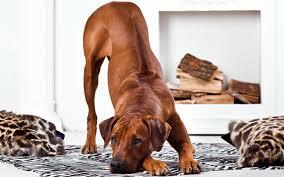 The Rhodesian Ridgeback is an intelligent breed, with a quirky sense of humor. They love being with people, and being in a family situation. When a stranger comes to the house, a Ridgeback will be alert, watching how you react. He will remain aloof at first, until he sees (and hears) that the visitor is welcome. Then his behavior starts to change. Frequently, a Ridgeback will walk slowly past the visitor's legs, then stop and lean against him, while looking elsewhere. If he gets some attention from the newcomer, the dog may well then sit on his feet, still gazing around to watch what others are doing. Once you become familiar with a particular Ridgeback, they will treat you like an old friend, practically bowling you over when you meet! This exuberance gets less as the dog matures and becomes an adult. 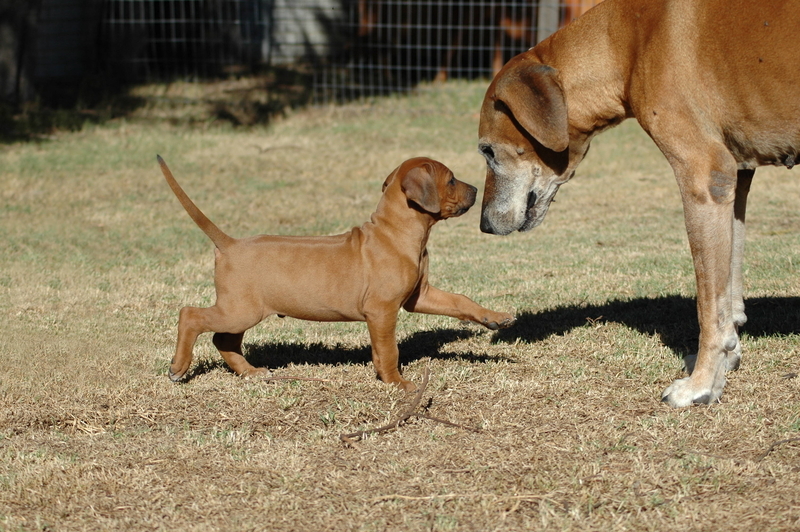 BUT Ridgebacks have an independent streak and need careful and firm training as puppies. They will tend to test you, and test how far they can challenge you, so you MUST be consistent with your training. The trainer I had to help me was an ex-army bomb dog trainer, and he gave me several insights into how a Ridgeback thinks. He always insisted that I always gave any command only once. If the dog didn't comply with my request, then I had to show him what I wanted. Simply repeating the command 3 times only teaches the dog to wait for the 3rd command before he does what you want! I well remember one occasion when my dog was about 12 months old; I ordered him to go to his bed, so that I could mow the grass without him getting in the way, and possibly getting injured. I knew for sure that he understood my command, but he just stared at me, and then slowly sat down. He was challenging me! Fortunately he wasn't (yet) too heavy for me to lift, so I picked him up and staggered over to his bed, where I gently deposited him. His face was a picture! After that event, if I commanded "Bed!" he RAN to his bed and stayed there. Lesson learned! I first came across the breed years ago, when I was visiting a local dog show. As I walked around the various pens and exhibits, I noticed what appeared to be a large ball of small children rolling around on the grass, giggling and laughing. I was a bit concerned about the child in the middle of the ball - and then realised that this bunch of kids were actually all clinging on to a dog - a Rhodesian Ridgeback. The Ridgeback is incredibly patient and gentle with small children. Nevertheless, a dog of this size should ALWAYS be watched when with kids, due to their weight and strength. Watching a Ridgeback play can be a little misleading, as they can appear to be ungainly, staggering around and losing their balance. They just love horsing about and playing the fool. This changes in an instant when the dog sees something to chase - they will take off with speed and grace, quickly overhauling a hare in full flight. They are FAST! And the poor hare is usually safe, as the Ridgeback was bred to chase and corner a lion, NOT to attack. If you have your Ridgeback out on a walk in the countryside, and you come across shallow water, the dog will love to run backwards and forwards through the water, showering water everywhere. They love playing in water, but aren't so keen on swimming. I had my dog at the beach in Australia some years ago, with my small son (then aged about 8 years old). We could walk out into the sea, and the dog would follow us wading around until the water came up to his shoulders, and then he would turn around and head back into shallower waters. He did NOT want to swim! 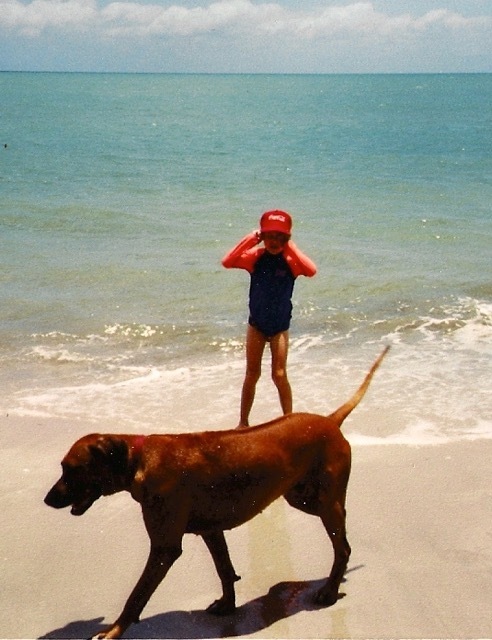 My own Rhodesian Ridgeback, Guinness, at the beach with my son. These dogs are athletic, and need a good sized yard to run around in, as well as good long run out several times a week. I used to take my dog running with me! So now let's take a look at some more details. The Ridgeback is a relatively recent breed, dating back to the early white settlers in Africa, to fill several roles; They wanted a large, powerful and agile dog that could be used in hunting, particularly for lions; but that would also be a family - friendly dog around the home , AND be an intimidating guard dog to protect the family and homestead from marauding animals and human bandits. They started with the local, fierce little Hottentot hunting dog (which had the ridge of fur on it’s back), and included breeds such as the Greyhound, Dalamation, and perhaps Mastiffs. As a hunting dog, they would NOT take on a lion one-to-one, of course! 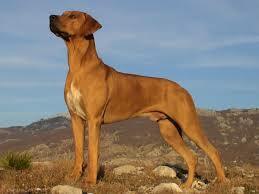 But a pack of 6 to 8 Ridgebacks could corner a lion and keep it contained until the hunter could shoot it. The dogs were agile and fast enough to evade the lion’s attacks, but big enough to intimidate it. Bred in Zimbabwe, the Ridgeback can tolerate extremes of heat AND cold overnight, but is generally better suited to a warmer climate. The breed spread to the United Kingdom, as english visitors to Rhodesia became familiar with the Ridgeback, and took good breedstock back home with them. From there they have continued to spread through Europe and of course the United States, Canada and Australia. The Rhodesian Ridgeback is NOT an easy dog to train. They need firm and clear instructions, and most of all consistent training.They also need quite a lot of exposure to sights, sounds, and meeting people. This breed is intelligent, with an independent streak and a quirky sense of humor. They will test you, to see if you stick to your guns with your commands, or whether you eventually give in. BUT you CANNOT be harsh or get physical with a Ridgeback, as they will basically shut down and ignore you. For this reason, a Rhodesian Ridgeback is better suited to an experienced dog owner. It is not really an ideal "first" dog, unless you are prepared to spend a lot of time in training and exercising the dog, and have access to a specialist dog trainer for assistance. After proper training, a Ridgeback will be obediant (mostly) and calm. But they do need and crave human company. If you will need to leave your dog alone at home for more than an hour or so at a time, I suggest you look for another breed. Left on their own, Ridgebacks will eventually become bored, and start to chew anything they can find. This breed is a very clean dog, and does not drool (except at mealtimes! ), and does not have a strong "doggy" smell. Their coat is short and dense, and they do not shed much hair at all, providing they are brushed every few days. If you want a guard dog, the Rhodesian Ridgeback will serve you well. They were originally bred and developed to protect the early white settlers in Africa, and are very loyal to their "family". They have the size and strength to intimidate most unwanted intruders, and have the bravery required (from their heritage as lion hunters) to take action if needed. This breed is normally relatively quiet, and they rarely bark. My own Rhodesian Ridgeback used to give more of a soft, throaty "cough" if he wanted to alert me to something. So if your dog barks, you'd better go see what's happening! When strangers come to visit the house, this breed will tend to just stand and stare, watching how it's owners interact with the newcomers. Even when it's obvious that the visitors are friends, the dog will still tend to be aloof at first, until it's certain that there is no threat. There is one basic color, and that is a glossy chestnut, with some dogs being lighter, and some a little darker. There may be a small white patch on the chest and perhaps one or two of the paws. The Rhodesian Ridgeback is an easy dog to groom. Their short coat hugs their body and does not need heavy maintenance. They only shed lightly, but need to be brushed at least once a week to remove any loose hair. These dogs don't tend to be very dirty or odorous as well, so they only need bathed every other month, or as needed. It is just as important to brush a Ridgeback’s teeth as its coat. Dogs that do not have their teeth brushed regularly may feel tooth pain, and are at risk to cavities, as well as mouth infections. By brushing a dog’s teeth, you remove plaque, prevent tartar buildup, and help freshen up their breath. It’s recommended that these dogs have their teeth brushed at least 2-3 times a week. I recommend Forever Bright Toothgel. As a dentist, I like this for humans, but it's just as good for dogs! 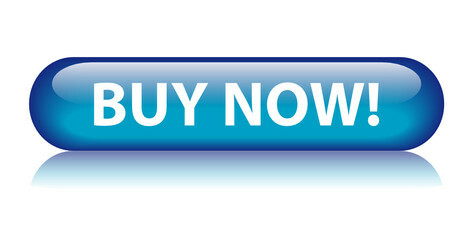 Click on the link below to buy it here! The Ridgeback’s nails grow quickly, and should be clipped before they are too long, typically every 2 or 3 weeks.